June 18th 2015 is the bicentennial anniversary of the battle of Waterloo. What better time to pay a return visit to Apsley House, the London home of the Duke of Wellington? Worth visiting at any time of year, Apsley House is one part art gallery – Wellington was allowed to keep much of the royal Spanish art collection he rescued from looters of the Napoleonic baggage train , so you’ll see Velasquez, Goya and other old masters on show. 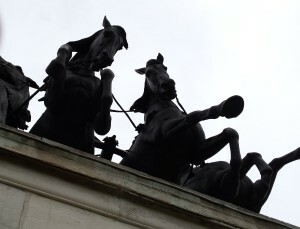 It is another part public celebration of its owner’s life – I have seen very few other houses in which portraits of the owner line quite so much of the wall space – and, above all, it is a commemoration of one of the great historical turning points – the epic battle itself. It stands to the side of Decimus Burton’s screen-entranceway to Hyde Park at the junction of Park Lane with Piccadilly, where the old toll house used to stand at the western approach to London and therefore glories in the address of addresses, No. 1, London. Many drivers will have passed it on a regular basis without even noticing its existence, as they, rightly, concentrate on negotiating the large traffic roundabout before which it stands. Within that roundabout is another monument now opened to the public for the first time – the Wellington Arch. Joint tickets, for entrance to both house and Arch are available at £10 (concessions £9) . 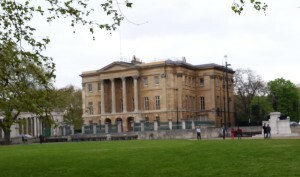 The house is open every day except Mondays and Tuesdays and is now operated by English Heritage, though it is still the London residence of the Wellington family. The public rooms are very much as they would have been during Wellington’s day and, currently, the Waterloo Room is set out as if for one of the famous Waterloo Banquets, held annually on 18th June. There will be three such banquets this anniversary year. The house originally belonged to the Iron Duke’s elder brother, who was regarded, before his younger sibling attained military glory, as the stellar member of the aristocratic, but impoverished, Irish family, as he was appointed Governor General of India. He encouraged his younger brother’s career (Arthur Wellesley was the third of five sons). Wellington was made a Colonel and took part in the battle of Seringapatam, against the forces of Tipu Sultan and thus began his military rise. Incidentally, an interesting relic of Tipu Sultan is the wonderful automaton displayed in the V & A Museum, known as ‘Tipoo’s Tiger’. When set working, the mechanical creature devours a mechanical redcoat. Apsley House also contains a remarkable number of portraits, statues and other objets relating to Wellington’s great adversary. The two men were contemporaries, both were 46 years old at the time of Waterloo and Wellington never met Napoleon, although he had the opportunity to do so. Maybe he regretted it, who knows, but he certainly collected all types of memorabilia belonging to and about his opponent, including his death mask, which is on show here. Napoleon’s is a definite presence at Apsley House, which seems only proper, as the wealth and adulation heaped upon Wellington by various royal families wouldn’t have accrued without him. The crowned heads of continental Europe were certainly very grateful, for the battle was a real turning point, they stood to lose everything. Was I the only visitor who, remembering Wellington’s later intractable opposition to any sort of social reform, wondered if victory by the begetter of the Code Napoleon might have meant a more progressive Europe and, maybe, a more progressive Britain? But then, by the time of Waterloo, Napoleon’s republican fervour had been replaced by dynastic ambition. Apsley House is a very male house (though not necessarily an overly ‘masculine’ one in decoration and taste). In part this is because, from the outset, it was Wellington’s public, not private, face. Kitty Pakenham, Wellington’s wife, did not live here, preferring the Wellington’s country house and she doesn’t feature much at all. There are, however, plenty of mentions of women, as ‘friends’ either with inverted commas or without. Overheard remark from one well-turned out young woman visitor to another – ‘It’s interesting, but there’s lots of willy waving.’ A contemporary take on historical events, or an ill-informed reaction to a different era? Or both? 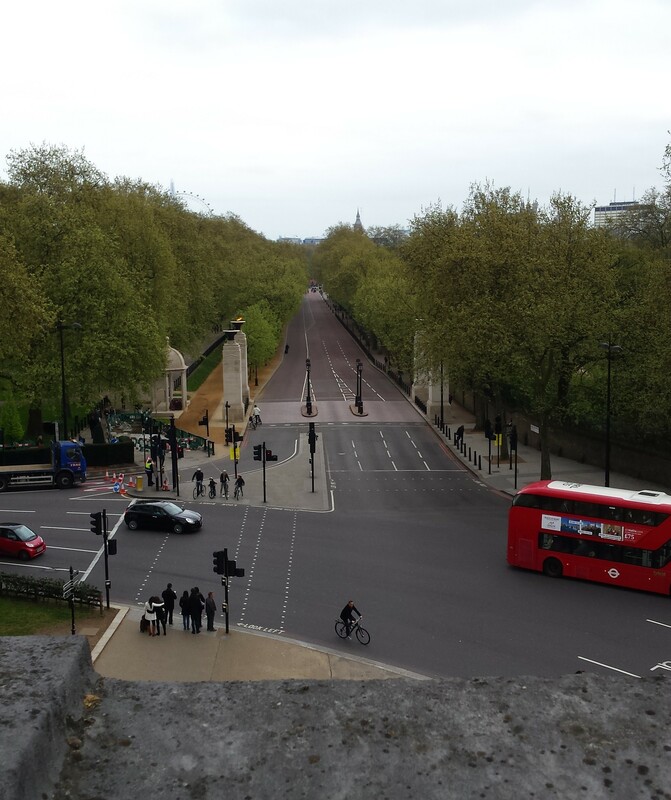 From the house one can see the equestrian statue of the 1st Duke, which stands on the traffic island (above right). 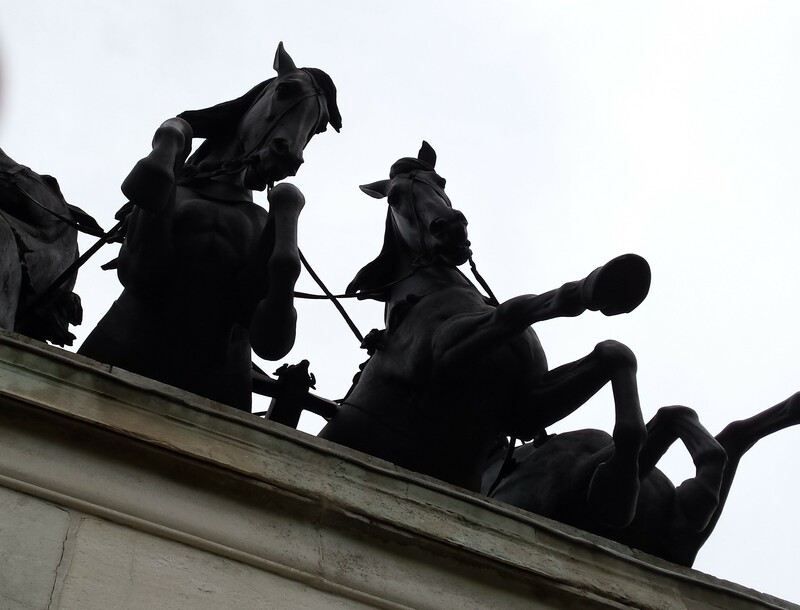 This would have been dwarfed by the version once mounted atop the Wellington Arch, the place of which has been taken by a bronze quadriga. The Arch has had a interesting life and one storey of it houses a small museum setting out its history. It has been moved on at least one occasion and was once the smallest police station in London, complete with station cat. On the upper floor is a comprehensive exhibition to the battle of Waterloo, including a flat screen computer depiction of the battle itself. The viewing galleries give an excellent prospect down Constitution Hill and there is a lift for those who want or need it. Standing on the island within the traffic roundabout for the first time, we also had the opportunity to look at other monuments there, all military memorials. The proximity of Anzac Day meant that many had flowers and wreaths laid before them. There are traditional memorials – to the Royal Artillery for example – as well as unusual and very modern ones, such as the collection of bronze pillars to the southern hemisphere forces, Antipodean, Indonesian and Polynesian. 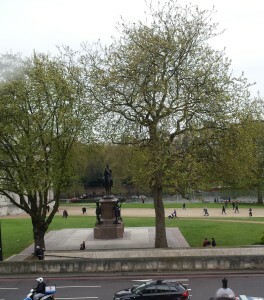 It seems fitting that the house of one of Britain’s greatest generals overlooks these memorials to the common soldiery. Please note, photography is not allowed of the inside of Apsley House, though there’s nothing to prevent the photographing the outside from within. 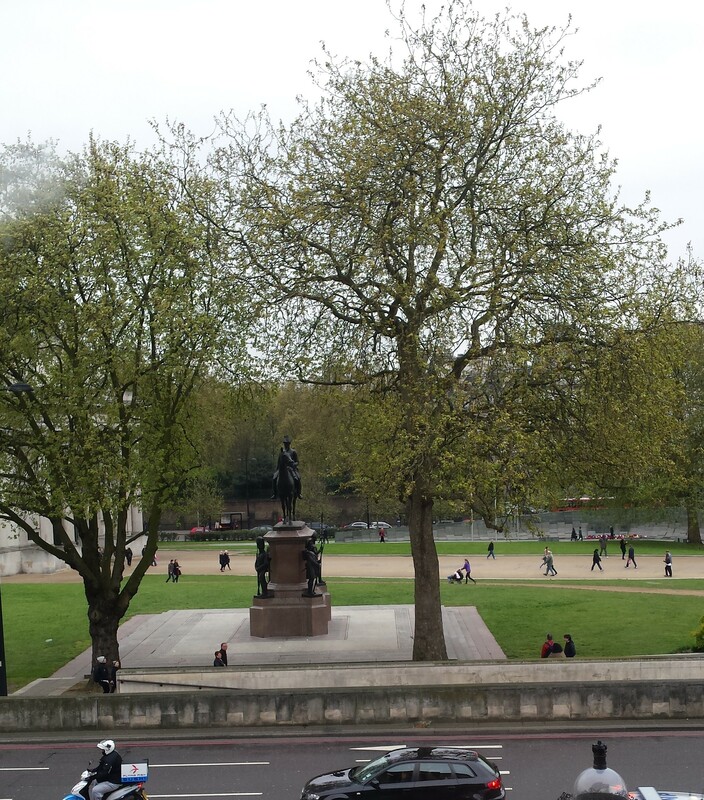 An old prospect… Visit to Hertford House Easter doings….. This entry was posted in Art, History and tagged Worth a visit by juliej. Bookmark the permalink. I’m glad it’s of interest to you. Let me know what you think of my posts ( or o guest bloggers ).